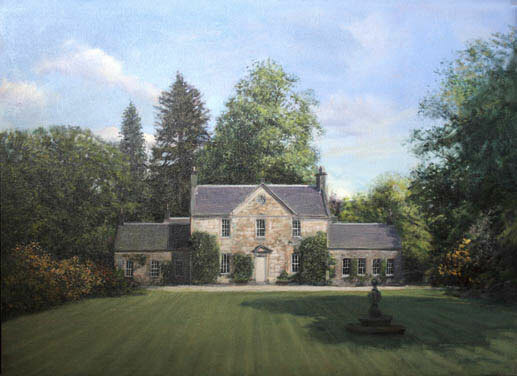 Portraits of Houses, Guy Lester, Landscape Portraiture. Guy Lester has been a full time landscape painter for so long that many trees that were planted at the time he left Camberwell Art School in 1979 have reached maturity. For the last 10 years he has, during the summer months, concentrated on commissions of gardens and houses, mostly in Britain and Europe. The British Isles is rightly famed for its gardens which unfold between the house and the departing distance, with fluent ease. Landscape painting is a traditional genre, in part, due to the power and beauty of subject matter which dictates its own terms. Dealing with this dictatorial mistress requires sensitivity and tact, traits which are apparent in Guy Lester's paintings by the way that the landscape comes back to life within the finished painting.